Are you planning an international trip? No, worries! Here is a Travel Planner with point plan that helps your international gateway a success. Always remember, ‘A good planning leads to a happy journey’. Hence, when you are in a plan to visit a foreign country, there are certain things to be done extra in order to ensure a stress-free experience. Request for necessary visa and check passport expiration: Prior to make any international travel plans it’s always best to recheck your passport’s expiration date as it should be valid up to 6 months after entering an offshore country. In case if your passport is approaching its expiration date, it’s necessary to renew your passport. A tourist visa is mandatory, to visit countries worldwide. Based on the visit of purpose and period of your stay the type of visa varies from country to country. Register your trip by checking your travel notifications: Ascribe to the State Department’s Consular Information program for all the necessary information and alerts regarding your trip. It’s admirable checking all the notices before booking a trip and before your departure. Smart Traveler Enrollment Program (STEP) is a program introduced by the State Department which is helpful at the time of any emergency. So it’s important for all the travelers to enroll in it. Get ready with your finical plan: Before planning a trip overseas, be aware of the exchange rate and let your bank and credit card providers know about your plan for not freezing your cards. It’s necessary to have an idea about the costs regarding the country you want to travel. Make sure to carry your travel documents: The most important thing is to carry a copy of your passport’s ID page. Also, you must carry the copies of hotel reservations, the confirmation of train tickets; a visa copy that refers you present travel. International driving permit: In order to fulfill your dream of an international road trip, it’s vital to obtain an international driving license. As it is illegal to drive without a valid driver’s license. You can get the permit from the National Auto Club. Acquire health and travel insurance: It’s essential to check your health insurance policy whether it includes international coverage. In case, your policy is not updated purchase an instant short-term plan that can cover you until are abroad. This is to make you safe and protect your whole trip. Get vaccinated and a surplus amount of medicine: In order to protect you from various diseases, climatic changes it’s advisable to get special vaccines or medications as a sign of precaution. 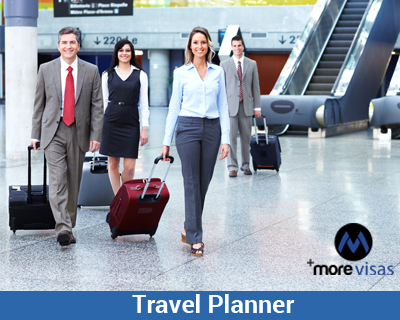 This point based step-by-step guide of Travel Planner, makes you aware of the knowledge needed to travel abroad. One can now easily plan an international trip by following the aforementioned steps. If you are interested, fill out our Enquiry Form so one of our visa expert will get back you.